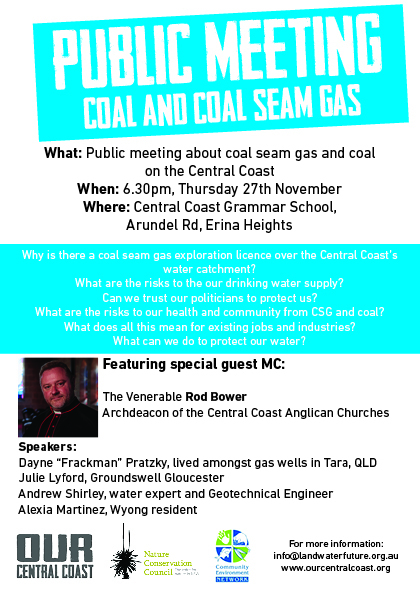 400 Central Coast residents packed out the Central Coast Grammar School hall on Thursday night (27/11) to learn about the risks posed by coal seam gas and coal mining to drinking water, local industries, nature and human health. 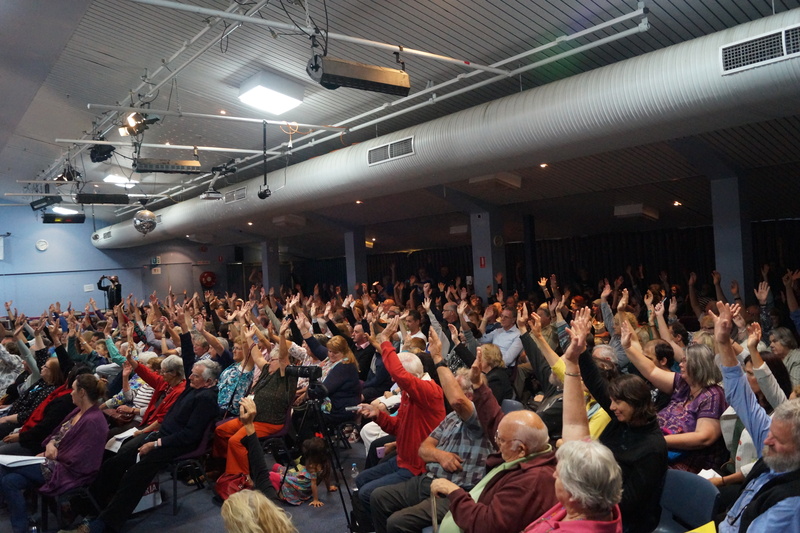 Gasfield Free Mountain Districts Co-convenor Simon Perry asked for a show of hands from the audience in support of the residents of the Mountain Districts and the community’s overwhelming desire to remain Gasfield Free. The result was a near unanimous raising of arms across the audience. 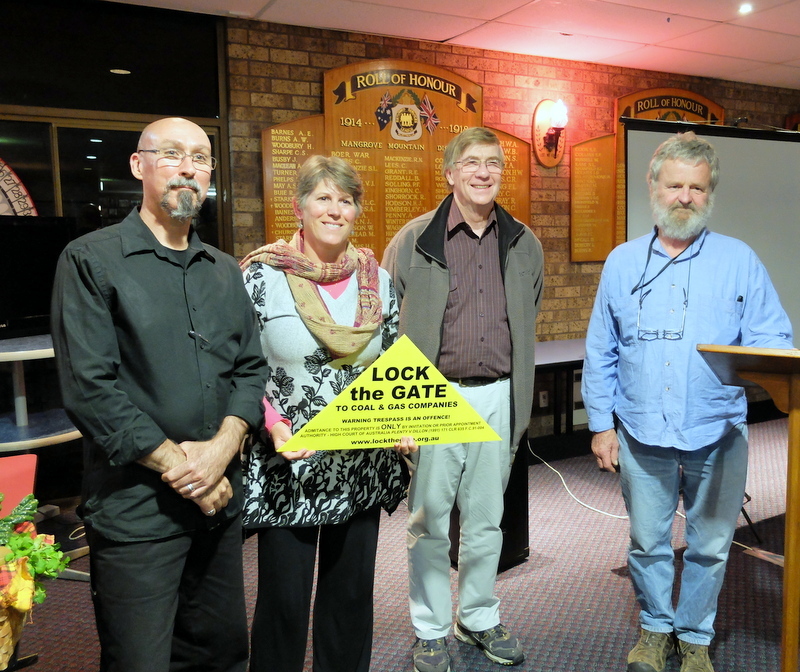 Local Anglican Church leader Father Rod Bower and Australian Actor Michael Caton kicked off a rousing program of speakers that included Kulnura local and expert on the aquifers Andrew Shirley and Julie Lyford (Chair – Groundswell Gloucester). Dayne Pratzky, feature of the soon to be released film Frackman described how he has been driven off his Tara property by CSG mining, and Jilliby local Alexia Martinez spoke on her concerns over coal mining. 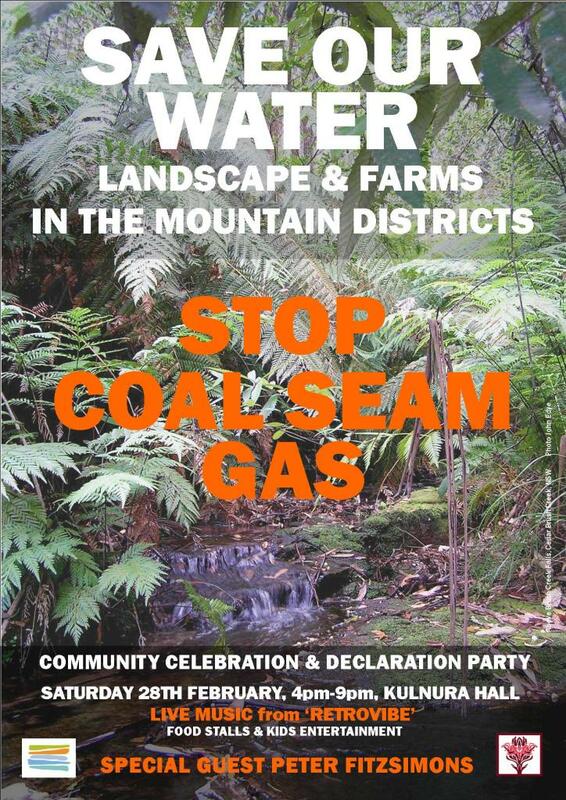 The Central Coast is at the frontline of coal seam gas and coal mining issues with much of the Mountains District and drinking water catchment for the Central Coast is overlaid by AGL’s coal seam gas exploration license. Speakers called on candidates from all political parties to take heed of the demands of local residents that the area be permanently protected from coal seam gas mining. 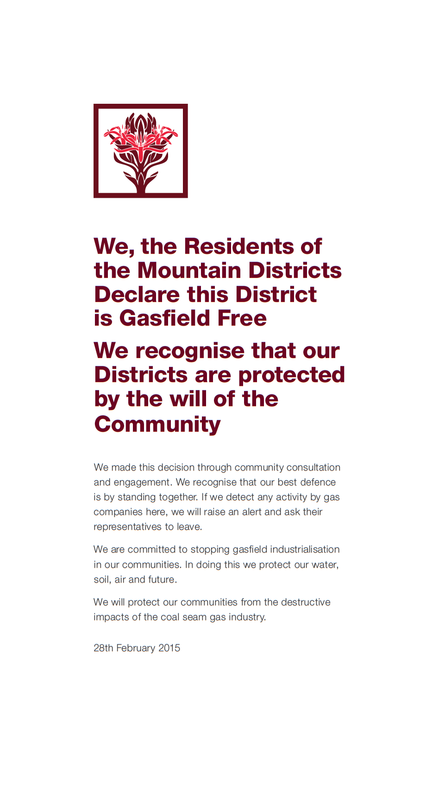 Momentum is building on the Coast to support a Gasfield Free Mountain District. community meeting being held at Central Coast Grammar School. 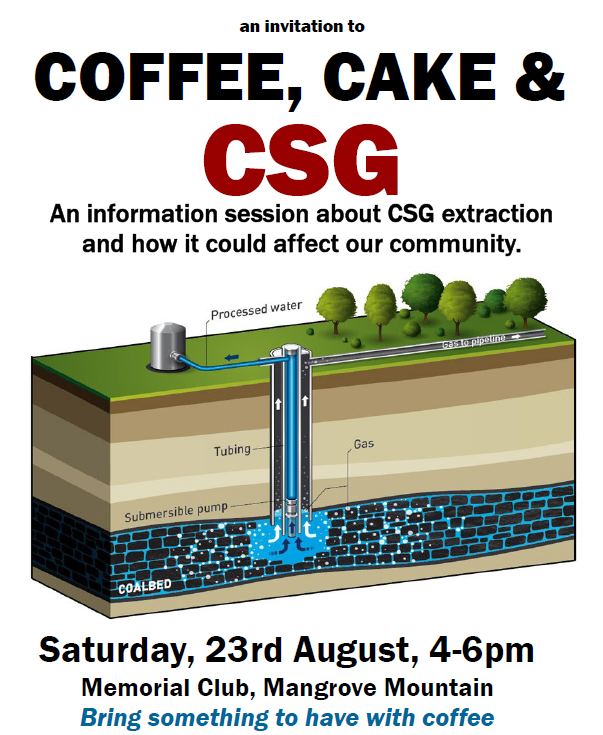 Come along to show the community that we don’t want CSG on the Mountain. Very important – please spread this to ALL your coastie contacts! …or at least Father Rod Bower of the Anglican Church, Gosford is. The Anglican Church in Mann Street Gosford is famous worldwide for the socially concious and sometimes provocative messages posted on the billboard outside the church. From supporting Gay Marriage to calling for humane treatment of asylum seekers to simply calling out Tony Abbott for being…well….Tony Abbott the church’s prominent billboard says it like it is. 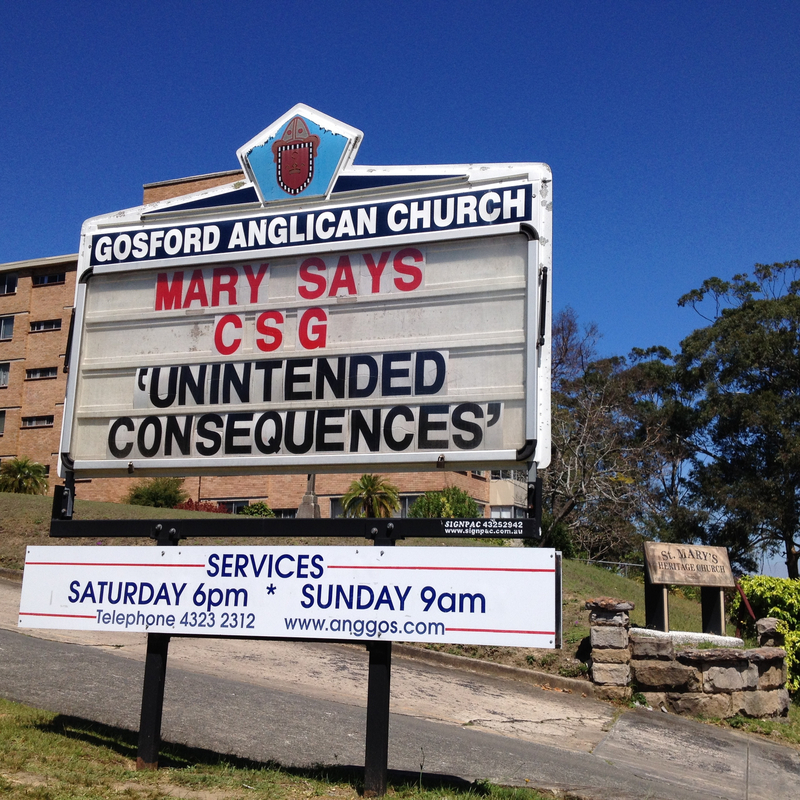 It is of course a nice play on words in a number of ways, but “Mary” in this case refers to Mary O’Kane (NSW Chief Scientist” who in her recently published Coal Seam Gas review stated that “Coal Seam Gas mining (can have) unintended consequences“. We met with Fr. Rod Bower a couple of weeks ago to explain what was happening with the Gasfree Mountain Districts campaign and explain our concerns regarding CSG mining and the aquifer we all rely upon and share, as well as share with the coastal communities of the Central Coast. Fr. Rod agrees with us that the risks to the aquifer are too great and that we cannot afford for the destruction of the ground water to be an “unintended consequence” of CSG mining. He offered to help spread the word via his billboard. The message above is the first of what should be a series of such messages from now through to March 2015 (the NSW State Election), part of our partnership with the Our Central Coast / Our Land, Our Water, Our Future campaign that we mentioned in our email news update last week. If you didn’t receive that email – make sure you subscribe for the next one using the link on the top right hand side of this website. Last Sunday a few of the Gasfield Free Mountain Districts Committee took part at the Mangrove Mountain Markets. Those of us there had a great time under sunny skies and really enjoyed the opportunity to engage with interested folk who came up to both find out what was going on as well as give words of thoughtful support. Last time we were at the markets so many folk wanted to sign a petition or similar that we decided it would be good idea to have a “message tree” that can be a place for folk to hang their words, whilst our volunteers work throughout the community conducting the formal survey. As a result our committee member Poppe got creative and built us a Message Tree out of a couple of Gymea Lillies, which is a great symbol of our local area and indeed one that our parent community group the MDA has chosen to symbolise the Mountain Districts.